Thomas Hart Benton’s 1930’s epic “America Today, Mural Rediscovered” is on display at the Met for the first time since acquisition in 2012. 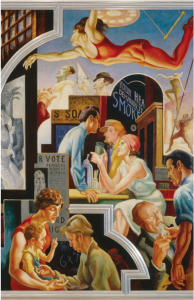 The 10-panel, wrap-around mural cycle was commissioned in 1930 for the boardroom of Manhattan’s New School for Social Research and is one of Benton’s most famous works. 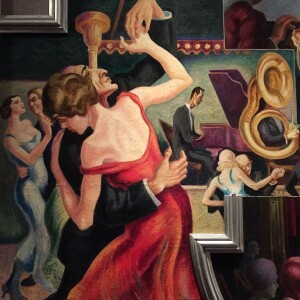 It depicts a panoramic sweep of rural and urban American life on the eve of the Great Depression and shows everyday people in scenes of life during that time–flappers, farmers, steel workers burlesque dancers, Wall Street tycoons and more. Lance Esplund of the Wall Street Journal called the mural “A roiling, illustrative melting-pot nearly 8 feet tall…it serves up the good, the bad and the ugly in equal measure.” Read the rest of his article for further description and history. The Met is displaying the massive seven-and-a-half foot tall murals in a faithful replica of the 30-by-22-foot boardroom for which the piece was originally created. On view in an adjacent gallery are Benton’s studies and sketches for the mural. Painter Jackson Pollock was Benton’s student during this time and he served as a model for several of the mural’s figures. Here’s the Met’s video curatorial overview of the installation. 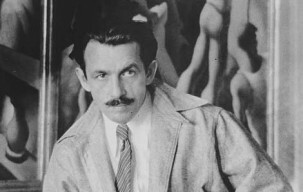 Thomas Hart Benton (1989-1975) was born in Missouri, studied in Paris and lived in New York for more than 20 years before returning to the Midwest to live and work.